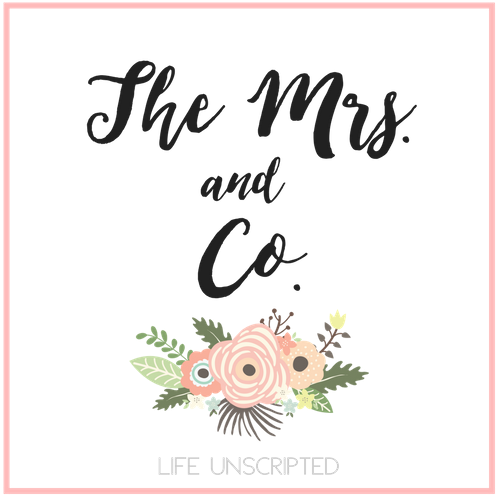 Blessings Along the Way - The Mrs. & Co.
As we go along our infertility journeys, sometimes we get so wrapped up in the process, we end up missing out on some amazing blessings that God has laid out for us. I completely understand being preoccupied with the this wonderful infertility journey, I am completely guilty of it. But if you slow down and really think about it, were there blessings that came along through this trying time that you encountered solely because of the infertility? When I began thinking about it, I had to think long and hard because honestly all I could think about was, "blessings? ummm, I can't have a baby. I am not blessed." I had to think past the baby wanting gene and dig deep. For better or worse. It wasn't until now that I truly understood those words. It's not until you really go through something this hard, that you realize what an amazing spouse you have, and I have a keeper. When we got pregnant in July 2013, we actually were gearing up for an IUI cycle. We had purchased all the medicine and miraculously, my insurance covered it! When does that happen? Since we didn't use the medicine for IUI, because I was pregnant, we were able to save it and use it for IVF after I had lost the pregnancy. It ended up saving us about $700. I know you're probably thinking, "how can the miscarriage be a blessing?" Let me elaborate. When we were gearing up for IUI in July 2013, we found out I was pregnant. We lost the baby 10 days later and were put in a holding pattern for 2 months while my body got over the miscarriage. During that time we were not allowed to do any treatments. We planned to do IUI once Kyle had his 6 month check up (we expected him to be cleared since we had gotten pregnant) and I had been cleared by my doctor. That date came and we found out that Kyle's surgery in fact had failed and we would need to do IVF. Had the miscarriage never happened, by the time we found out we needed to do IVF, we probably would have been into our 2nd IUI cycle that wouldn't have worked. IVF would have needed to happen with or without the miscarriage, but the miscarriage forced us to not be able to do the IUI, which in the end would have been in vain. The miscarriage itself was hard emotionally, but it ended up saving us from more emotional heartache due to failed IUI's and financial heartache too. Kyle and I have amazing families that rally when someone needs them. Recently, we have been given enough money by one of our family members to pay for 1 round of IVF. They gave it to us this past weekend, and with me being on a crazy amount of hormones from the shots, I couldn't help but cry my eyes out. Whether this cycle works or doesn't, we now have extra money to use to buy things for the babies if it does work, and to try again if it doesn't. Because after this round, we would have to spend a lot of time saving to try again. We are truly blessed by an amazing family. My body is responding beautifully to the medicine. They have to continuously lower my shot dosage because my body is growing my eggs so quickly! Right now we have 14 amazingly beautiful eggs that are growing perfectly! My uterine lining is growing exactly like it should, and I can't help but thank God for allowing my body to handle this entire process so beautifully. I can only pray that my body will do the same for the pregnancy. Through my infertility, I have reconnected with so many friends. I can't tell you how many times I have had someone contact me and say "I've just had this feeling to contact you. You've been on my heart a lot." That my friend, is not just a feeling, it's the Holy Spirit. Recently, I have reconnected with a friend from elementary school. She also dealt with infertility, but is now pregnant with triplets! Yes, you read that right. TRIPLETS! I am over the moon happy for her and can't wait to meet their sweet babies in early March of next year! Even though these past 15 months have been trying, I wouldn't trade them for anything. It will make everything we have longed for that much sweeter. What blessings have you seen along the way of your infertility journey? This post is amazing. I love that you have been able to find the hidden blessings and encourage others to do the same. I'm thankful that The Lord worked Himself into our journey. When I tell Claire and others our story, there is no way I can't tell it without including Him. I'm thankful for how it tested my faith and continued to build my relationship with The Lord. I'm also thankful for the friendships and relationships brought about through our journey. Especially with YOU Miss Ashely! Even though your road has taken you down a more difficult path than I had, I hope that I have helped in a small way. I truly truly feel that sharing our stories and being a compassionate ear is SO important! I'm thankful that Claire is so loved and prayed for. Not that other kids aren't, but Claire was prayed for and deeply desired for many many months before she was the size of a sesame seed in my stomach. And last but not least, I'm thankful that in the hard times of being pregnant and taking care of her, The Lord reminds me how blessed I am and quickly, my frustration/pain/tiredness is replaced by thankfulness. Wow. I really enjoyed thinking through all that and typing it out. Hi Ashley! I'm Naomi & I just started a blog recently, just like you. I LOVE your blog (found it through Amber Massey's blog) and I just want to let you know how much of an encouragement your blog has been. For anything anyone is struggling with, these reminders & your outlook is wonderful. I'd love to email with you about some more things in depth…if you're okay with that! Feel free to contact me…I couldn't find your contact info or email anywhere on here- I figured maybe you didn't have that out for public knowledge. Feel free to contact me at naomicarpenter3@gmail.com & feel free to check out my blog at wonderfullyvanilla.blogspot.com. Thanks again for your encouragement and your reminders that God has GREAT things planned for us.